[PDF] Information Computing and Applications, Part II: Second International Conference, ICICA 2011, Qinhuangdao, China, October 28-31, 2011. Proceedings, ... in Computer and Information Science) | Free eBooks Download - EBOOKEE! 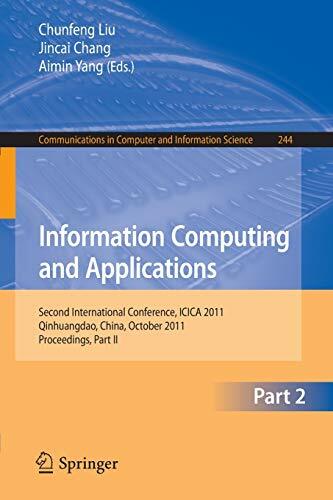 Description: Product Description: The two-volume set, CCIS 243 and CCIS 244, constitutes the refereed proceedings of the Second International Conference on Information Computing and Applications, ICICA 2010, held in Qinhuangdao, China, in October 2011. The 191 papers presented in both volumes were carefully reviewed and selected from numerous submissions. They are organized in topical sections on computational statistics, social networking and computing, evolutionary computing and applications, information education and application, internet and web computing, scientific and engineering computing, system simulation computing, bio-inspired and DNA computing, internet and Web computing, multimedia networking and computing, parallel and distributed computing. No comments for "[PDF] Information Computing and Applications, Part II: Second International Conference, ICICA 2011, Qinhuangdao, China, October 28-31, 2011. Proceedings, ... in Computer and Information Science)".